Doubleday Books for Young Readers, 9781524768966, 32pp. Fans of the hit I Don't Want to Be a Frog will hop with joy for this fourth book in the series—a hilarious and clever twist on the classic childhood issue of not wanting to go to bed. Frog is excited about autumn and the coming of winter. But when Owl informs him that frogs hibernate till spring, Frog is upset at missing out on all the snowy fun. In this hysterically funny twist on the classic "I don't want to go to bed" dilemma, Frog comes up with all kinds of reasons why he's not going to sleep through winter, until he devises a clever way to convince his friends to come along for the ride. Featuring the beloved young frog character from the hit I Don't Want to Be a Frog and his cast of zany animal friends, this new story is sure to bring a smile to every kid who's ever protested at bedtime. And parents will appreciate a bold new twist on a timeless childhood topic. It's another surefire crowd pleaser and perfect read-aloud. And look for the other books starring Frog: I Don't Want to Be a Frog, I Don't Want to Be Big, and There's Nothing to Do!. 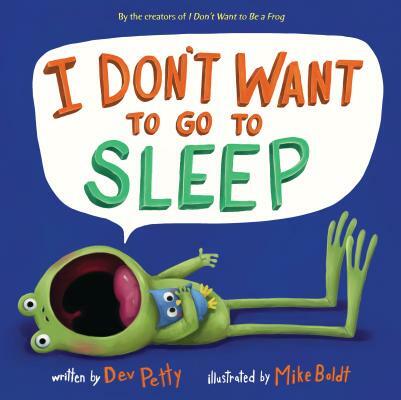 DEV PETTY is the author of I Don't Want to Be a Frog, I Don't Want to Be Big, There's Nothing to Do!, and I Don't Want to Go to Sleep. A graduate of the University of California, Santa Cruz, Dev previously worked as a visual-effects artist in film, contributing to such movies as the Matrix Trilogy. Dev was born and raised in Berkeley, California, and now lives right next door in Albany with her husband, two daughters, some dogs, and other critters. Visit her online at devpetty.com and on Twitter at @devpetty. MIKE BOLDT is an author and illustrator living in the countryside of Alberta, Canada. He has illustrated many books for children, including the picture books I Don't Want to Be a Frog, I Don't Want to Be Big, There's Nothing to Do!, and I Don't Want to Go to Sleep. When he's not drawing, he's building snow forts and Lego spaceships with his three kids, or sharing laughs and his ice cream with his wife. He is very glad he's not a frog. Visit Mike online at mikeboldt.ca and on Twitter at @MikeBoldt.